Mara, now chairman of the Manchester Police Athletic League, was among the VIPs on hand Sunday afternoon for the “great reveal” of a $1 million renovation project at the Michael Briggs Community Center, where Manchester PAL programs have been offering constructive alternatives for inner-city youth since 2004. 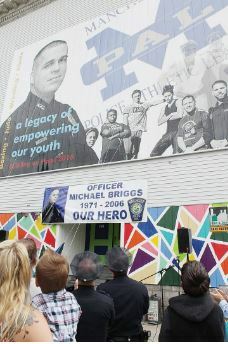 The building was renamed the Manchester Police Athletic League/Michael Briggs Community Center in 2007 in honor of fallen officer Michael Briggs, who was gunned down in the line of duty in 2006. Volunteers from Building on Hope, a New Hampshire-based group that works with non-profit organizations to renovate their facilities, chose the Briggs center for their 2016 project, setting the stage for the complete transformation of the building and the PAL program. The exterior renovations include a new, colorful facade dominated by an artist’s rendering of the building’s namesake, with the words “A legacy of empowering our youth,” emblazoned across the front. At the side entrance, a silhouette of Briggs with a youngster in hand greets those who walk through the door. Inside, visitors to the “reveal” marveled at the newly constructed and outfitted game rooms, computer room, and a regulation-sized boxing ring that dominates a downstairs gym with rowing machines and a host of other exercise equipment. A new community room and commercially outfitted kitchen will set the stage for a variety of offerings, including a new cooking program and other life skills training to complement the traditional athletic programs like wrestling, boxing and judo. Volunteers from Building on Hope, their T-shirts emblazoned with the slogan “Many hands make light work” were sprinkled throughout the crowd of dignitaries, curious neighbors, PAL members and their families. “Michael Briggs, who patrolled this area, is watching over us,” Mara said. U.S. Sen. Kelly Ayotte brought a flag that has flown over the nation’s Capitol to be raised over the building in honor of Briggs. When the time came to present the flag to MPAL officer John Levasseur, Chief Nick Willard asked wounded officer Ryan Hardy, one of two Manchester officers injured in a shooting May 13, to do the honors. “Officer Ryan Hardy, you embody everything that Mike Briggs was,” he said, as the parents of the fallen officer, Lee and Maryann Briggs, looked on. A small crew of designers, architects and carpenters from Building on Hope began working on the project about three months ago, but the bulk of the interior renovations and new equipment installation took place over a 10-day “extreme makeover” period, in which hundreds of volunteers descended on the building. Leslie Thompson, a regional manager for Walmart, has brought a team for each of the past three Building on Hope projects. Mayor Ted Gatsas estimated that $1.6 million was donated in goods and labor to make the project possible. The city fronted $500,000 to get the ball rolling, all of which has since been repaid thanks to individual and corporate contributions. That includes $25,000 from Great NH Restaurants and $25,000 from Liberty Utilities. The city contributed $25,000 in community development block grant funding. Volunteers present for “the reveal” watched with pride as youngsters of all ages filled the building, marvelling at the way it has been transformed. Gibran Ortiz-Perez, 24, was one of those kids. Now a volunteer at the center, he recently graduated from NHTI with a degree in criminal justice and hopes to soon become a Manchester police officer.